I don't think you've seen this yet, but our little Pia has the sweetest little marking on her tail. About a half inch from it's tip, there's a little white band. It's a marvelous tail. 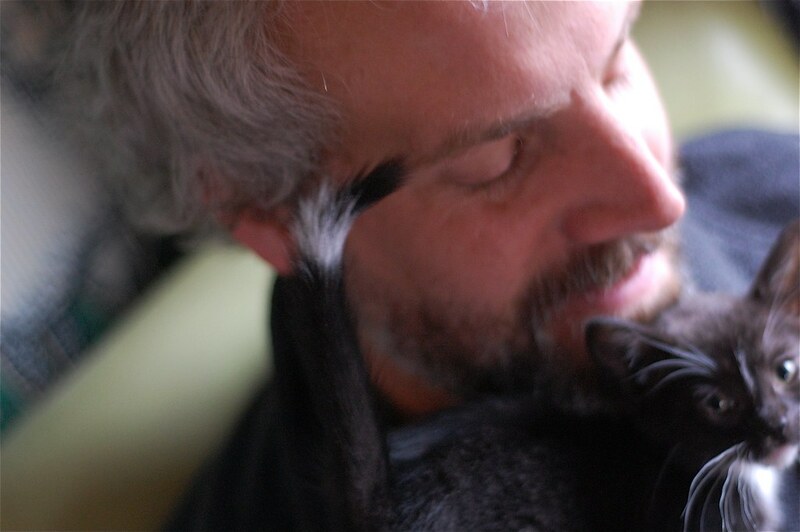 I might even go as far to say it makes my "top five best kitten tails" list. And I've seen a LOT of kitten tails in my day. She's very proud of her tail and loves swishing it about. What a lovely little girl! That is a most awesome tail!! Our Angel has that ring too. That's how she got her name, in fact--we thought it looked like a little halo. that's the best tail ever! i bet these kittens would make excellent therapy cats. they're so friendly and wonderful! It's like a Dr. Suess tail! LOVE IT! the white part seems to be a bit longer haired. That is the cutest kitten tail I've ever seen! Oh man, I want to adopt that cat. I miss having a tuxedo girl in my life. Hah! Oh my gosh, look at that! Martin Hooper, if you click on the first pic, the flickr site will open in a new window and you'll be able to see it. Dunno why it won't show on here thoough.. I have a tortie with a pure white tip on her tail, about an inch long. It sort of glows in the dark, too - if I'm following her into a dark room I can see the tail floating ahead of me. Certainly Charlene's tail is in the top 5! This is so damned cute! Well, who wouldn't be proud of such a distinctive tail! The _rest_ of her is adorable, why shouldn't her tail be, too? 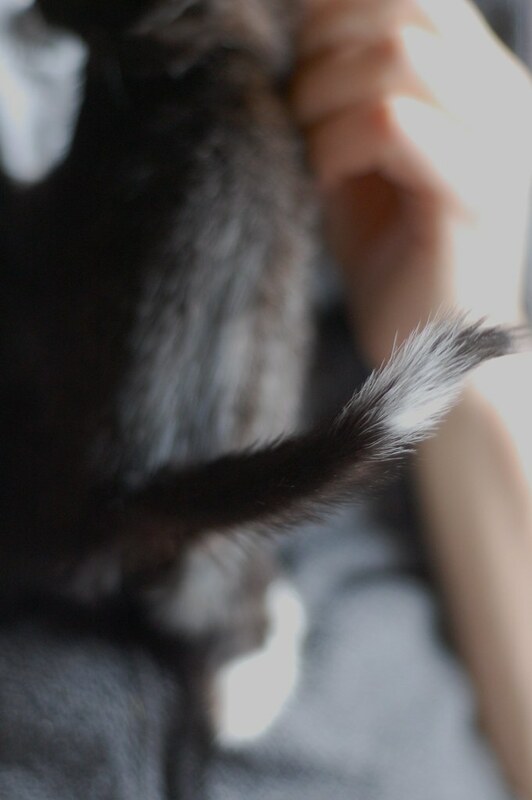 I have never seen such a cute, distinctive little kitten tail! Tho I am nowhere near the expert that Laurie is! omg i love that kitten! That is a VERY Seussical tail. It is very Seussical! The first picture is too cute. She's looking back at the camera, showing off her ringed tail. Darling! that is the most Amazing tail! Proof that magic is real. Laurie, I'm going to venture a guess that your number one kitten tail belonged to sweet Gerald Leland Pickett, who of course, was tail-less, but was loved beyond belief by you and many of us. Ah, bittersweet memories. He is playing with Drewey in kitty heaven, sweet boy. that tail is a genetic masterpiece! 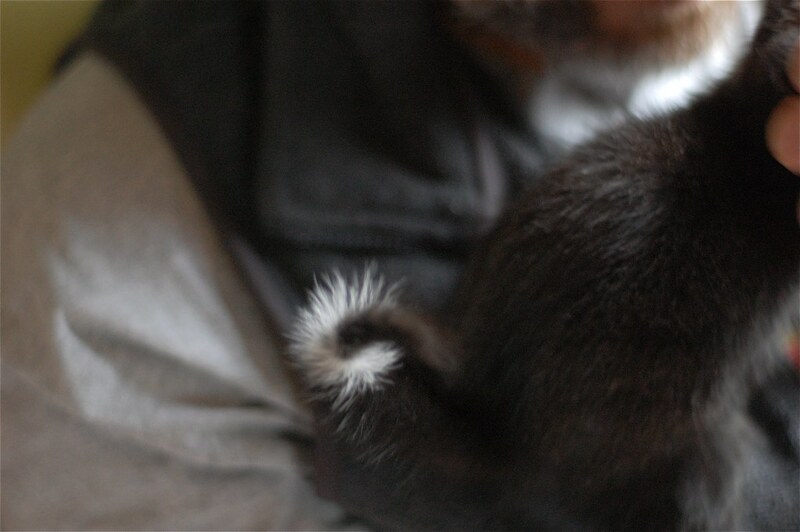 We absolutely DEMAND to see the top five cutest kitten tails. You don't even have to name them, in order to avoid hurt feelings. We just want to see them. That is just adorable! Such kitty tail perfection! I wonder if the wiry donut still appears, now that she's a big, beautiful girl.